Lock in a great price for Gema Hotel – rated 8.1 by recent guests! Excellent very friendly staff, good bed, clean room, simple but good breakfast, nice bar, good location, parking space. The breakfasts were very nice. The couple who run the hotel, Jaime and his wife Blanca, could not have been more helpful and friendly. Staff were very friendly and efficient. Standard of cleanliness was excellent too. In need of updating but this is being done after October. Gema Hotel This rating is a reflection of how the property compares to the industry standard when it comes to price, facilities and services available. It's based on a self-evaluation by the property. Use this rating to help choose your stay! 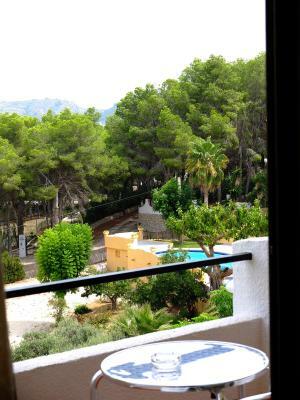 One of our top picks in Moraira.This family hotel is located in a tranquil area on the Moraira coast, only 800 feet from Cala L’Andragó beach and 1.2 mi from the town center. 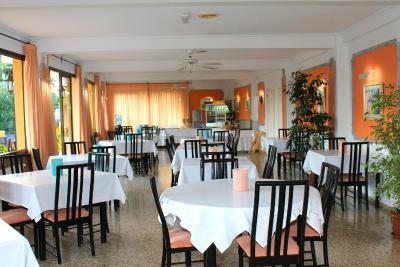 The hotel offers comfortable and pleasant bedrooms, the majority of which have a terrace with great views. In the complex, the services are designed to cater for adults and children. This is a three-story building surrounded by 26 ft² of gardens and two swimming pools, one for adults and the other for children with a play area. When would you like to stay at Gema Hotel? This spacious room has a TV, desk, heating and a ceiling fan. The private bathroom includes toiletries. This room has a balcony offering pleasant views. It has central heating, TV and a telephone. This twin room has a balcony, tile/marble floor and flat-screen TV. 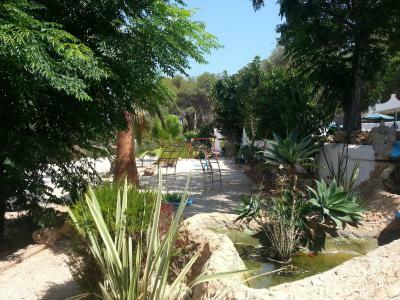 Good option for combine beach and pool area, close to a great variety of good restaurants. The garden and the terrace are perfect for a drink after a sunny day on the beach. House Rules Gema Hotel takes special requests – add in the next step! Gema Hotel accepts these cards and reserves the right to temporarily hold an amount prior to arrival. The facilities in the rooms are rather basic and although clean, there was a lack of amenities one would find in a modern hotel room. No small refrigerator in the room - no safe - no restaurant - difficult access in and out the swimming pool. No air conditioning so very uncomfortable at night. Breakfast was very basic as just low quality cheese slices. No tea/ coffee facilities in the room. Cleanliness and the staff. Good portions of fruit and fresh juice was the positive aspect. No internet in room. No air conditioning. Prefer hotels without dogs allowed. Needs an upgrade. Old and tired. There wasn’t ant air con, but price wise cannot really complain. The air conditioning in the room is not very effective but I understand that the hotel will be refurbished and this will be better next year. However as I had a balcony I left the window open and there was a lovely breeze. Does need a general facelift. A well placed hotel close to restaurants.